This page: Johnson County War, the Seige of the TA. Following the killing of Nick Ray and Nate Champion, the regulators rested at a friendly ranch and the following day headed out in the direction of Buffalo. The Regulators had stationed Phil DuFran, formerly Horace Plunkett's foreman, in Buffalo to spy on the town. Outriders were warned by DuFran of the approach of a posse of 150 armed men under the command of Andrew S. "Arapahoe" Brown, a former captain in the Confederate Army. Sam Clover, a reporter for the Chicago Herald covering the expedition, decided that he did not need to stick around and took off for Buffalo. Fortunately, he had a friend in the military stationed in Buffalo who vouched for him. 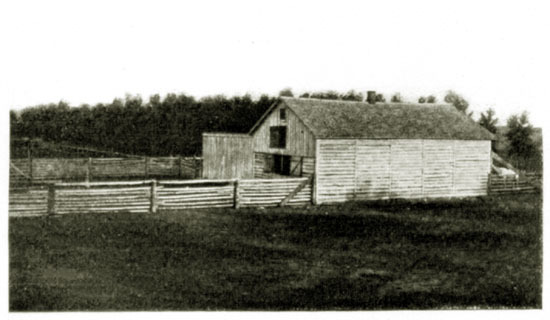 Richard M. Allen, the assistant manager for the Standard Cattle Company, determined that discretion and good sense was the better part of valor and also left for Buffalo. Allen was less fortunate. He left his horse at the livery stable and attempted to depart on the next stage. Both he and the brand on his horse were recognized. He was removed from the stage and taken into custody. The stage left without him. 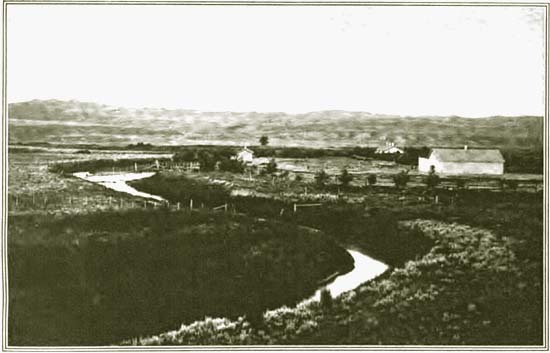 The TA Ranch, 1890's, looking east. Back south of town, Major Wolcott, resuming commnand, ordered, over the objection of Smith and Canton, a retreat to the TA Ranch about 12 miles from Buffalo. The TA Ranch was ideally suited for defense. The house already had a 7 ft. fence around it and was situated in a bend in Crazy Woman Creek. Behind the house was an ice house which would provide a defensive outpost. To the west of the house was the stable. In the loft, the regulators drilled holes to provide gun ports, visible below the loft window in the photo above. To the west of the stable was a knoll on which the regulators undertook the construction of a fort. A defense breastwork was also constructed to the rear and east of the house. The Stable at the T A. Soon the posse arrived. 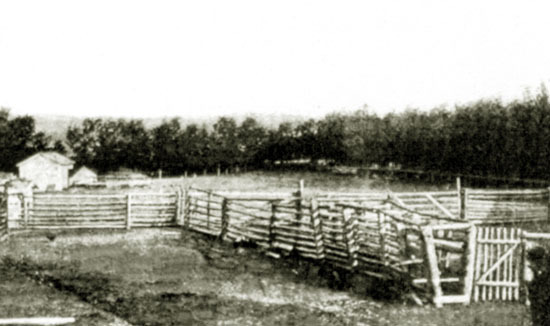 The settlers began the construction of rifle pits. Considering the defensive position of the T A, Araphaho Brown realized that a direct frontal assualt on the ranch would be too costly. The men would not tdubt be simply mowed down by the fire power of the regulators. It would probably require a cannon to blow the regulators out of their position. Brown, who was a blacksmith by trade, started to build a homemade cannon. At the same time, some cowbys headed toward Fourt McKinney fifteen miles away with the thought of borrowing or stealing a cannon from the military. Brown's homemade cannon unfortunately blew up. The Corral at the T A. "That rawhide was as cool as a steer's nose and all he did was load that buffalo rifle and shoot. While loading the gun he would chew steadily on a cut of 'baccy. He would pack the powder and ball keeping his jaw working in time with the up and down movement of the ramrod. When he got her all set and a cap on the firing pit, he would turn his head and let out a squirt of 'baccy juice and raise the gun and BOOM it would go and a ball would hit a door or window every time he shot. * * * * The old fellow kept his work up for two and a half days. He sent a waddy to his home with orders to his wife for ammunition and for her to get to making bullets and a steady supply kept coming. She was on the job doing her part too. 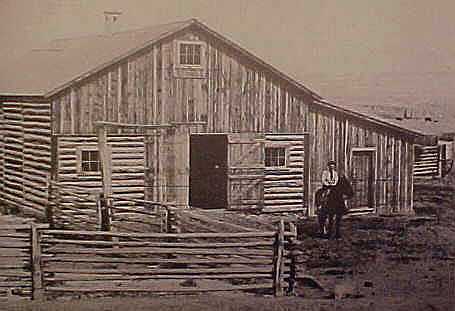 Although the Wyoming Inland Telegraph Company was making every effort to get the line to Cheyenne open, messages were unable to get through to Cheyenne. On Tuesday, a message finally reached Acting Governor Amos W. Barber, yet no reply came from Cheyenne. 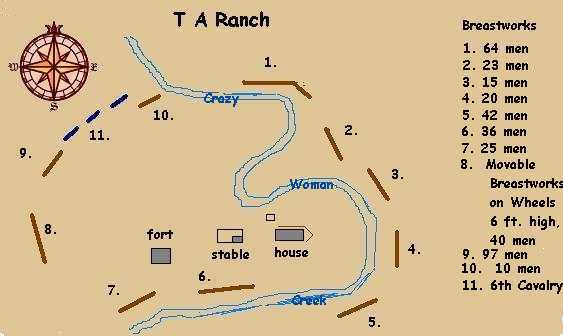 Map of the Seige of the T A Ranch. From within the beseiged T A, Mike Shonsey rode out under a white flag. The sheriff's men though he wanted to parley, but then Shonsey made a break for it. He was able to get through the surrounding lines and rode 100 miles further to the south where a telegraph line was open. With a message concerning the dire straits the regulators found themselves, action was taken by Acting Governor Barber. Certainly, among those beseiged were some who were not without political influence. W. C. Irvine and Hubert E. Teschemacher had been members of the 1889 Constitutional Convention. Acting Governor Barber promptly telegraphed Senators J. M. Carey and F. E. Warren in Washington, who in turn rushed to the White House and aroused President Harrison from his bed. Presidential Orders went to Fort McKinney to relieve the seige and take the regulators into custody. "I started at once for axes at the various ranches. By mid-night there were cutters working and it was not long until timber began to be placed on the ground. We tied the logs with our ropes to the rear end of the wagons and by daylight had our breastworks ready. At daylight we started to push the wagons ahead of us moving slowly towards the ranch buildings a short distance at a time. There was only 60 of us that could get shelter besides the pushers and we kept up a steady fire. Among us was the old Buffalo gunner. The defenders observed the wheels and realized that the freight wagons used by the regulators, had been coverted into a movable breastwork and from which the dynamite brought in by the regulators would soon be lobbed. Baker estimated that the men on the movable breastworks were within a half hour of being within throwing range. In the distance, however, a bugle was heard, signaling the arrival of the 6th Cavalry led by Col. James Judson Van Horn. Beneath a white flag, Major Wolcott, gave a bow to Col. Van Horn, and offered his surrender to the 6th Cavalry, but refused to surrender to Sheriff Angus. Angus, however, secured the agreement that the expedition would be turned over to Civil Authority for trial. The prisoners were sent to Fort McKinney. Authorities fearing the wrath of the local citizenry, transferred the prisoners to Fort D. A. Russell for safe keeping. Their fears may have been justified, for a few days later the barracks at McKinney were bombed by three cowboys who were allegedly members of the "Red Sash Gang." T. Joe Cahill, who later knew many of the Cheyenne cattlemen involved in the invasion, expressed the opinion in a 1955 interview, that had not Col. Van Horn arrived when he did, the Invaders would have been "exterminated" within an hour. The Court held that the regulators probably would be unable to receive a fair trial in Buffalo and, thus, transferred venue to Laramie County. In 1890, Johnson County had but a population of 2,357 and in 1900 only four more. The cost of feeding and housing the inmates was visited upon the nearly empty County coffers. Thus it was that the County literally could not afford the cost of the prosecution. By the time the case was called for trial the County owed more than $18,000 and the case was dropped. That, however, did not end the tale.